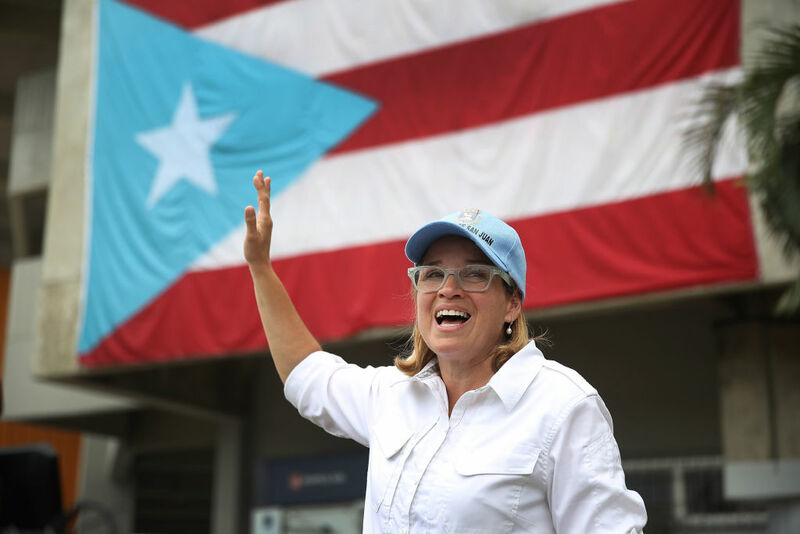 San Juan mayor Carmen Yulín Cruz gained international attention by challenging Donald Trump’s callous response to Hurricane María. Now she’s co-chairing Bernie Sanders’s presidential campaign. The strategic considerations driving Sanders’s choice are more straightforward. The Trump administration’s bungled response to Hurricane María remains one of its landmark failures, obvious to all. By selecting Trump’s most visible and strident antagonist on the issue, the self-styled “nasty” woman who denounced the president for the “unfathomable action of throwing paper towels at us [Puerto Ricans],” Sanders reminds primary voters of his willingness to challenge the president head on. Disaster capitalism has also worked to depopulate the island, with a disproportionate number of Puerto Ricans leaving for Orlando, Kissimmee, Tampa Bay and Miami. The electoral calculus here is clear. Florida remains at the crux of any Democratic candidates’ presidential aspirations. What is less obvious is how the relationship with Sanders will shape Puerto Rican politics, and whether Cruz intends to use her ties in Washington as a springboard for her own run for governor. The mayor is in a bind similar to that which Sanders faced in 2016. The party establishment is suspicious of her position on the island’s status (full sovereignty as the formula for decolonization) as well as her dalliances with socialist positions and organizations. The PDP remains divided between those who favor permanent union with the United States, whatever the circumstances, and the soberanistas or libre asociacionistas, who seek more autonomy and share a commitment to social justice. The former fear that Cruz will take over the party and move it to the left, embracing policies and positions reviled by those with ties to bondholders and corporate capital. The mayor would likely have to enter into a gubernatorial primary with an establishment candidate. Roberto Prats, her likely opponent, was rather fittingly the co-chair of Hillary Clinton’s 2008 and 2016 primary campaigns on the island. Known for his boyish good looks and eye for the camera, Prats has not offered a thoughtful remark or profound insight in his more than twenty years in public life. Following a term in the Senate and his last electoral defeat in 2004, he has dedicated himself to more profitable activities as a lawyer and lobbyist. Intellectual hollowness aside, his clear-cut appeal would be as the ready-made, electable alternative to the unquestionably calamitous current governor, Ricardo Rosselló, who declared his intention to run for reelection some weeks ago. Rosselló’s governorship has been disastrous in predictable ways. With no experience in the public sector and a declared taste for austerity and privatization, his term has been as misguided as it has been incompetent. While the now-governor was happy to promise vulture funds that he would pay the island’s unaudited debt while campaigning as a candidate, he has now come to the rather obvious conclusion that such an endeavor is impossible. He pleads constantly for more flexibility from the Junta de Supervisión Fiscal (Fiscal Supervisory Board), the seven-member body with full powers to oversee the island’s finances imposed by Congress and President Obama in 2016, but to no avail. Rosselló’s role has been simply to participate in a charade in which the junta first floats a harsh version of austerity, then sits back to see society’s response, before finally settling on a marginally less harsh reform that Rosselló then pushes under the pretense that he is making a reasonable compromise. The governor has failed at the most basic of tasks — receiving congressionally appropriated funds that have already been apportioned for his administration’s use. Intent on privatizing public corporations and importing the regressive charter school model to the island, he has not passed one tangible measure to improve the lives of workers or the poor. Without a plan or a vision, bereft of anything but unimaginative media advisers and stale ideas around him, he is increasingly captive to the conservative, Trump-like elements of his party, whose most recent coup de grace was the proposed construction of a Square of Believers (Plaza de Creyentes) outside the capital building, to the tune of nearly $200,000. Money surely well spent on an island where children go to bed hungry. Even more frightening has been the governor’s travails in Washington. He ran on a ticket with Jennifer González, a former NPP speaker of the house and now resident commissioner, Puerto Rico’s non-voting, single member in the US House of Representatives. Known for little beyond her avid enthusiasm for President Trump, she famously declared, in the aftermath of Hurricane María, that “everything we’ve asked for, Trump has provided.” Paper towels notwithstanding, most in the media and on the island would beg to differ. With Puerto Rico sorely in need of reconstruction funds, González decided that pushing for statehood was the most apt use of her time. More recently, she has been unable to prevent drastic cuts to food stamps for the nearly 1.5 million islanders who benefit from federal programs. The Puerto Rican Federal Affairs Administration’s (PRFAA) efforts have been similarly pitiful. Ostensibly created to defend the interests of islanders and lobby Congress to bolster economic development, Rosselló appointee Carlos Mercader has spent his time cuddling up to Republicans and endlessly discussing the importance of statehood as the utopian solution to all Puerto Rico’s problems. The PRFAA’s operation is “a joke, almost criminally negligent in its lack of focus,” one senior congressional staffer — who’s been working to secure reconstruction funds for the island — told me. Another congressional staffer with decades of experience working with Puerto Rican officeholders and appointees was less sanguine: “Mercader? He’s a clown. Rosselló needs to send him home.” Mercader’s unmatched move to date: paying Trump’s former campaign manager Corey Lewandowski a healthy sum to represent Puerto Rico in Washington. We must laugh, if only not to cry. What can be gleaned so far is that Fuentes was opposed to the fact that the Treasury Department of a bankrupt country, headed then by its now-reappointed secretary, Raúl Maldonado, gave out contracts to the tune of at least $2.8 million, apparently with serious irregularities, to known benefactors of the New Progressive Party. These benefactors have, in turn, subcontracted Maldonado’s son, who through at least five different companies offers his surely fantastic services to seven government agencies, one municipality, and the Senate. All this at a time when Secretary Maldonado was the chief official in charge of reviewing and approving all contracts worth over $10,000 with the Puerto Rican government. These officials are, for the most part, neither malicious nor malevolent. In office, Rosselló has rejected mobilization of his own constituents in favor of mollification of the various wings of the NPP. And this means corruption, which he must accept, or at least ignore, to sustain his support in the party. It is a strategy as much as a shortcoming. Incapable of exercising hegemony and unable to use force, Gramsci reminds us that “between consent and force stands corruption/fraud.” Like father, like son. Faced with this disastrous landscape, the temptation of a safe, centrist option like Prats is understandable. But like Hillary Clinton in 2016, that would be a mistake. Unimaginative moderation has run its course, in Puerto Rico possibly more than elsewhere. PDP elites have ceased offering a robust opposition; those in the Senate and the House suffer from a lack of ideas, not to mention grassroots support. Much like the pro-statehood party, they offer little in the way of policies or platforms. Wait and see; pressure and hope. It’s uninspiring at best, actively negligent at worst. Last Monday, March 11, a new party was officially launched. Termed the Movimiento Victoria Ciudadana (the Citizens’ Victory Movement), the organization has faltered out of the gates. Although some of its proposals are very promising and its personalities serious, for now it has avoided the type of popular mobilization and participation crucial to overturning the two-party system. Facebook polls and clever Instagram stories aside, elections are not won without the masses, who must be included in deliberations rather than dictated to from stages. While they will surely threaten the Puerto Rican Independence Party’s (PIP) 2 percent vote share and siphon votes from the PDP, it is still unknown if they can play a more prominent role in the gubernatorial race, beyond indirectly facilitating Rosselló’s triumph. None of this is to say that Carmen Yulín Cruz is the perfect candidate. In her time as mayor, she has proven actively unwilling to construct a mass partisan organization. The PDP’s San Juan Central Committee has been especially neglected. The mythical source of longtime San Juan Mayor (1946-1969) Felisa Rincón de Gautier’s immense power and influence, the committee remains dormant. In contrast to the first woman to be elected mayor of a capital city in the Americas, Yulín Cruz has preferred to rely on municipal employees as her base. Consequently, she has gained little traction in the PDP’s island-wide executive organs, signaling a troubling rejection of the mass party model. The team around Yulín Cruz is also small and lacking in intellectual heft, recycled and reshaped in ways that show a troubling unwillingness to take counsel from thoughtful staff. Unlike Sanders, she has not embraced the left-wing academics and intellectuals scattered throughout Puerto Rico’s universities and the diaspora, many of whom have deliberated for years about the island’s colonial conundrum. Nor has she spent sufficient effort supporting down-ballot candidates so as to swing the PDP in a more progressive direction. Even in the case of an electoral victory, constant pressure and mobilization would be required to ensure half-measures and paltry compromises are thoroughly rebuked. Political struggles do not end now, nor have they ever, on election day. Many in the independence movement and socialist organizations will point to other faults, including Yulín Cruz’s links to a party unwilling to fully reject the colonial status quo. Others will mention her inability to consistently connect with grassroots activists, work with more progressive advisers, or formulate an ideological alternative to austerity and submission to bondholders and the neocolonial junta. In this, they are right. What such critiques always fail to offer, however, is a feasible path through which to defeat Rosselló and to prevent the disastrous outcomes another four years of NPP rule will unquestionably entail. The current governor’s assault on trade unions, student groups, and environmental activists has made abundantly clear that his party is preparing the ground on which a tax-free, privatized haven for the rich can be built. But it has also shown that in Puerto Rico, the question at issue is not just that of “statehood, status quo, or republic.” It has revealed that NPP rule is synonymous with the unlimited despotism of one class over all others. That social justice and inclusive growth is no longer of concern to one of the island’s main political parties. That four more years of austerity should come accompanied with a complementary plane ticket to all those it will surely drive off of the island. To such outcomes, Bernie Sanders, as well as Massachusetts senator Elizabeth Warren, have offered tangible alternatives. In late November 2017, they proposed a “Marshall Plan for Puerto Rico,” an ambitious bill aimed at boosting economic development and accelerating reconstruction on the island. The proposed legislation, which was not even considered by the Republican Congress, is still only a small step towards recognizing America’s debt to its neocolonial Caribbean outpost. But it has the potential to at least allow Puerto Ricans to countenance a different set of possibilities. It is in building that alternative future where Sanders’s support for Cruz could prove pivotal. He should break from American presidential candidates’ longstanding practice of eschewing any substantive commentary on Puerto Rican politics. He should make clear that the democratic socialism he promotes is simply incompatible with the regressive and ill-advised measures of both the current governor and the Fiscal Supervisory Board appointed to keep the island’s finances in check. Both Sanders and Cruz have their faults, but on the key issues, they are right: enacting ambitious job programs, strong environmental regulations, and massive investments in public housing and education; embracing unions as partners, rather than enemies; ending corporate tax exemptions that fail to generate jobs; and passing Medicare for All are just some of the issues on which they coincide. Mayor Cruz may well prefer to contend for resident commissioner or make a turn towards fuller involvement in mainland politics. Both would be a mistake. Sanders should encourage his campaign co-chair to enter a primary fight of her own: “Run, Carmen, Run,” should be his counsel. Puerto Rico deserves a governor for the many, not the few. José Ciro Martínez is a Title A research fellow at Trinity College, University of Cambridge. He is from San Juan, Puerto Rico.